When I started out on this study, it had nothing to do with the birth date or the death date of the Lord Jesus Christ. A book claimed a certain number of days that had passed from the return of the Jews from Babylon to the birth of the nation of Israel in 1948. That study is still in progress somewhat but I have debunked what I started out to prove. A revision of that book has been printed with changes (not because of me I'm sure) and it still has incorrect information. What is so important about proving or disproving some dates that took place almost 2000 years ago? Well the answer is the same with anything in the Word, gems. If God chose to share a detail, well who am I just to chuck it by the way side? As it turns out, I have broken a few engrained dogmatic paradigms and gained a deep appreciation for the truth and the awe that it produces. Truly, the truth shall set you free. I am about to present an unraveled tapestry, piece by piece, with the hopes that when I am done, you will see the beauty that I have been given to discover. This will not be an easy undertaking as I am not much of an orator, but the Spirit will reveal to whom He will. We all know the story of the birth of Christ, but unfortunately, it has come down to an incorrect nativity scene of tradition. What happened at the time of the Lord's birth? Who were the wise men? Who was Herod? When did he live and die? Who cares? Maybe I will raise more questions than answers. If that happens, ask me. I will ask the Lord. Since no one from our time was there and because everyone has become cynical, what I am going to present you, you will either love or hate. I have been very blessed by this and I am at peace with this information. I asked the Lord why this endeavor took place. I once told someone what I was doing and was laughed at not only for it's seemingly insignificance, but because everyone says it cannot be proven. When I was asked why I bothered, I told them that honestly... "to have an answer when asked." To quote the good book, 1st Peter 3:15 "But sanctify the Lord God in your hearts: and be ready always to give an answer to every man that asketh you a reason of the hope that is in you with meekness and fear". Some may call it cynicism, but by a bad experience, I learned that you cannot just trust what Christians say. Too many leap without knowing the facts or worse quote another who is not of the fold. Unlike any other time in history, I believe the church is losing its credibility. When the world believes more in aliens than in Jesus, there is something seriously wrong with the body of Christ. Therefore, when I read an incredible claim by a Christian I investigate. That action alone has given me a great understanding into people, and into the workings of the Word of God. Am I an expert? Not on your life! Do I claim to have all the answers? Yes! I say that because I know where to go to get them - the Holy Spirit, John 16:13 . Sometimes the answer is "yes", sometimes "no", and sometimes "wait", but an answer is always given. The entire Bible is pointing to One individual, Jesus Christ. Consequently, He is the answer to everything. To me, that alone is worth the time, prayer, and sleepless nights to find out more about my Savior. At this point, I have to start to prepare you for what I first believed before confirmation. All rituals that the Jews kept in the Old Testament pointed to Christ in types and symbols. So many that that alone would be a worthy study. Precedence established in the Word allows me to believe all the major events of Jesus' life would occur on certain feast days. For instance, the very day of the Exodus from Egypt, 430 years passed from the time the promise made to Abraham about his seed. Genesis 15:13 , Genesis 17:5 , Exodus 12:41 . To quote the Family Bible, "God graciously communicates to his people as much knowledge of the future as will best fit them for the discharge of their duty; and what would not be useful to them he kindly withholds." Primarily, the Scriptures interpret Scripture. When you are stuck, go back to the word. Albeit obtaining may take a lifetime, what joy when it all fits. Enough preparation, on to the facts! There really is not a starting point because one thing leads to another and yet to another, so let us begin with the visit of the Angel Gabriel. Luke 1:23-27 "And it came to pass, that, as soon as the days of his ministration were accomplished, he departed to his own house. To a virgin espoused to a man whose name was Joseph, of the house of David; and the virgin's name was Mary. " Clue: Here it is the sixth month of Elisabeth's gestation that Gabriel visits Mary. After explaining how the Holy Spirit would come and overshadow her and she would conceive the Angel tells her that her cousin Elisabeth is already six months pregnant with John the Baptist. Luke 1:36 "And, behold, thy cousin Elisabeth, she hath also conceived a son in her old age: and this is the sixth month with her, who was called barren." Knowing this, you understand now why there were people (possibly just all the priests - Mishna, Sukkah 55b) to wondered why he was tarrying so long (Luke 1:21 ). After 7 Sivan 3753 (15 May 8 BC) a week later, at midday on the Sabbath, Zacharias was able to return home to his wife Elisabeth. Well before that happened old Zacharias had a visit from our messenger Gabriel that Zacharias would have a son and that his name would be John, filled with the Holy Ghost even from within the womb. Because Zacharias did not believe the angel, he was made dumb until the time be fulfilled. Luke 1:24 says that after those days, when he went home after he finished his duties, his wife conceived. Since this occurred in Sivan, and Elisabeth hid herself 5 months, and in the 6th month the Angel Gabriel went to visit Mary, you count six months: Sivan, Tammuz, Av, Elul, Tishrei, Cheshvan, and the first week of Kislev (Nov/Dec). After the 8th of Kislev Elisabeth would have been 6 months with child. So Gabriel could have visited any time after that, but before the 8 of Tevet (7th month of Elisabeth). Since this study shows how amazingly the feasts of scripture point to Jesus, it's only fitting that the Lord would put "icing on the cake" if Jesus was conceived during the festival of lights - Chanukah (25 Kislev)!! Jesus is the light of men (John 1:4 ) and John was the witness of the Light (John 1:7 ). How very fitting for Mary to go and be with John's mother Elisabeth in the 6th month and she herself being overshadowed by the Holy Spirit, conceived on the Festival of Lights! To further this wonder, this feast is also called the Feast of Dedication, where even Jesus participated by going to the temple one winter, John 10:22 . Since Jesus is the Word of God, this day God "Dedicated" His Son to us like authors do in books where they dedicate their work to the reader! Now, Mary stayed with Elisabeth for 3 months (Luke 1:56-57 ) and made haste to go to Elisabeth after the prophecy of Gabriel (Luke 1:39 ) and when Mary met Elisabeth, Elisabeth was filled with the Holy Ghost as promised by Gabriel, filling the babe even from the womb (Luke 1:15 , Luke 1:44 ). Clue: Jesus' birthday. I believe it was 15 Tishri 3755 (8 October 7 BC - Julian). Why this year? Many things, but one is that it needed to contain Adar II (Jewish leap year). Again, because of precedence, I always believed that Jesus was born on 15 Tishri, just didn't know what year, until I read Luke's account and found out when the time frame of Gabriel's visit, both to Zacharias and Mary. For the visit to be in the month Kislev, and have a normal pregnancy, there needed to be another month in the cycle to land near Tishrei, Adar II fit that bill and was present in the year 3754. If Mary was impregnated the Feast of Dedication (24 Kislev - 2 Tevet), for Jesus to be born on 15th of Tishrei, Jesus would have had a gestation period of 308 days or 44 weeks or 11 months. This is very possible since there was no way to induce labor back then. Now those of you who have kids (especially women) won't believe that this is possible today since the normal gestation period is between 266 and 280 days. My own father-in-law was a "donkey baby". The gestation of a donkey is between 10 1/2 months and 14 months. He was born after 11 months (exactly 44 weeks) in the womb, hence the nick name. Obviously this trip of Mary on a donkey for 80 miles induced labor. Nothing is an accident for God and I believe this took place just so Jesus could be born on the 15th of Tishrei, the Feast of Tabernacles. The beauty of this is that on the 8th day from birth of Jesus He would have been circumcised. This day is called the Simhat Torah, meaning literally "the rejoicing of the Torah." It is on this day that the rabbis in the synagogues take the Torah scrolls out of their places and dance with them as though the Torah had come to life - as if the Word of God came alive! Oh how close they come to the truth! (II Timothy 3:7) This would also help understand that even though the census was called, why there would still be no room in the inn - all the mandatory visitors to Jerusalem for Sukkot! I know that you are a bit confused. Some Jewish calendar facts need to be established. Nisan is the beginning of the sacred calendar year. Tishrei is the beginning of the civic calendar year. You just about need a slide rule, easel and charts to understand it all. Well this also pushed me to write a program in Visual Basic that did just that. This obtained calendar algorithm was confirmed against 500 known Jewish dates. My program shows the serial day number (used by astronomers), Jewish date, Julian date, and the Gregorian date. The Julian date was used from 45 BC to 2 September 1752 in the English speaking world. After that date, we changed to the Gregorian calendar. Clue: Josephus was a historian just after the time of Christ (37 AD to c. 100 AD). He gives detailed accounts of events from Creation to his time. We all know of the story of King Herod in his immense insecurity tried to kill Jesus. So first, King Herod had to have died after Jesus was born. Josephus says that Herod died shortly after a lunar eclipse (that fell on a fast day) but before the Passover (14 Nisan at sundown), Book XVII, Chap. 6, para. 4 & 5 and Chap. 9, para. 3. I turned to NASA to get a list of all lunar eclipses during this timeframe. Of course they gave me all the information I needed except if, in this list, the eclipses would be visible from Jerusalem. They did provide a way to find out through a complicated mathematical process, so I had to write another program to determine which eclipses would be visible from Jerusalem. Starting with a date of Herod's assumed death of 4 BC, and the year type (leap year) requiring an Adar II, I found one eclipse, 14 Adar II 3757 (13 March 4 BC). Why this one? Well because of the fast day that Josephus mentioned. The ONLY eclipse that fell the night of a fast day was the Fast of Esther, 13 Adar II 3757 (12 March 4 BC). Dates change at sundown in a Jewish calendar instead of midnight. From this date to 1 Nisan 3757 (29 March 4 BC) Herod had to have died. Jesus would have been about three and-a-half years old at the time of Herod's death. Clue: Why 15 Tishrei? Because of the date of Jesus death and all the types in Scripture, I believed it had to be the Feast of Tabernacles. Here's why. John mentions in 1:14 of Jesus "And the Word was made flesh, and dwelt among us..." the word "dwelt" comes from the greek work skenoo which means to tent or encamp, to reside as God did in the Tabernacle. Well this set off a little flag for me because in the Old Testament, Zechariah talks about this day. In Zechariah 14:16 "And it shall come to pass, that every one that is left of all the nations which came against Jerusalem shall even go up from year to year to worship the King, the LORD of hosts, and to keep the feast of tabernacles." The feast of tabernacles was just a feast to remind Israel of their wanderings and was made to "dwell" in booths (tents). Why would all nations come to worship the King [of Kings] on that day? Well my wife is from Spain and Spain is a monarchal society. They celebrate the birthday of their king, as do other monarchial nations. Assumption: if Jesus' birthday is 15 Tishrei [the Feast of Tabernacle] that would help the understanding of this verse. Sadly enough, this feast is also the time when Israel began to reject their Messiah, Luke 4:24 . Herod's last days were very perilous for everyone. So when the wise men came inquiring about "He who is born King of the Jews" [Herod's title by the way], Herod lost it. The Scriptures say that Herod ordered the scribes to find out what city this child would be born. They told him Bethlehem [House of Bread - fitting for the Bread of Life]. By this time, Jesus was in a house and no longer in a manger, Matthew 2:11 . Paradigm one destroyed - no wise men at the manger. This is why Herod ordered to have all children two years and younger killed, Matthew 2:16 . However, Joseph was warned in a dream (Matthew 2:13-15 ) to flee to Egypt (Hosea 11:1) from the wrath of a crazed man, as were the wise men when they left Jesus. Now I am sure you are asking why Joseph would stay in Bethlehem when he only went there for the taxation, Luke 2:1 . Well that is where Joseph was from, Luke 2:3 . When he had to go, he had to bring Mary with him because if she gave birth while he was gone, the town's folk surely would have put her to death for infidelity. Remember Mary was pregnant before her and Joseph were married. Therefore, Joseph made Mary take the long hard trip to Bethlehem. I am sure that Jesus may have been born a bit early after such a hard trip, but all this was planned from the foundation of the world and nothing came as a surprise to God. Again, I am sure you are asking again, how could Mary conceal she was 11 months pregnant? They did not wear skintight clothes back then, and I am certain that every precaution was made for the afore mentioned reason. Since this was a taxation decree, Bethlehem had many visitors, so the inns were full. Jesus was made to be put into a manger. Eight days later, they went to Jerusalem to have Jesus circumcised. This one was really a hard one to do until I had Jesus' birthday. I literally went through the entire Bible looking for any reference to a date, day, month, or year. It is amazing all the events that happen on the exact same day, but that is another study. It took me over five months to do, but I am so enriched because of it. With the establishment of 15 Tishrei as a base period, we can also figure out and understand the events of Jesus' death. Luke 3:23 says that when Jesus started His ministry He was about 30 years old. As we can see from Luke 3:21 Jesus was baptized and went into the wilderness for 40 days where He was tempted by the devil. Having died to His flesh (as we all must - I'm not suggesting a 40 day fast, but death to self - Romans 8:8-9) Jesus returned to Galilee in the power of the Spirit, taught in the synagogues of the region. When He made it to Nazareth on a Sabbath, He entered the synagogue where He grew up (Luke 4:16) and read from the scriptures Isaiah 61:1-2, however, He stopped half way through verse 2 because the judgment day was not yet come. He told them in a nutshell, Who He was, the Son of God. This happened in the month of Heshvan according to the Triennial Cycle when the Haftorah reading (afternoon reading of the Torah) of that passage is selected. For that year it was 27 Heshvan 3785 (18 November 24 AD). This is 4th sabbath of the month which signifies that Isaiah 61:1-2 be read. This shows too that before going to the wilderness Jesus had not yet reached His 30th birthday and the importance and accuracy of scripture by its use of "about" in "about 30 years of age" at His baptism, then He preached in the synagogues of Galilee and went home to preach in His hometown were all prophets are first rejected, Luke 4:24. 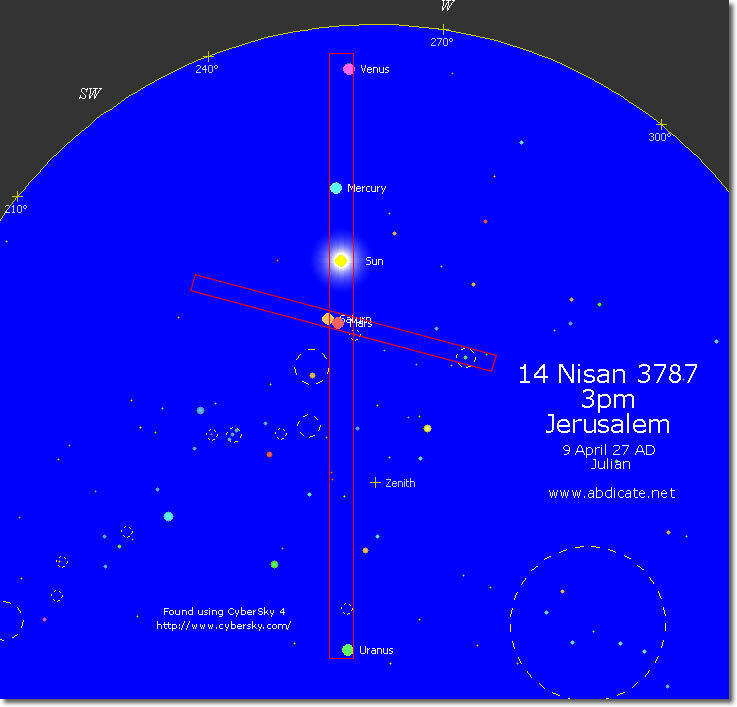 Click here to view a star map at 3pm in Jerusalem on the 14th of Nisan 3787. His story is written in the Heavens. In this image, Notice where the sun is located! Furthermore, the sun was darkened so they would have been able to see this in the sky right above Jerusalem! The sun is in the constellation Aries – the Ram. The sacrifice! Genesis 22:8 Also the 7th of the 12 signs. In Hebrew it is called Taleh meaning "The Lamb". In Syriac it’s called Amroo meaning "Lamb of God". John 1:36 The named stars in Aries are Al Sheratan meaning “The bruised” or “The wounded” and another is El Nath meaning “wounded” or “slain” and finally Mesartim (Sharatan in Hebrew) meaning “The bound”. Why does this matter? I Chronicles 16:31"Let the heavens be glad, and let the earth rejoice: and let men say among the nations, The LORD reigneth." Psalms 8:3-4 "When I consider thy heavens, the work of thy fingers, the moon and the stars, which thou hast ordained; What is man, that thou art mindful of him? and the son of man, that thou visitest him?" Psalms 19:1 "The heavens declare the glory of God; and the firmament sheweth his handywork." Psalms 89:5a "And the heavens shall praise thy wonders, O LORD:"
How can I be sure? Scripture. The day 14 Nisan is the day when the sacrifice for the Passover is slain. It was on this day that Jesus was presented by Pilate at 6 am [sixth hour Roman Time - not Jewish] to the crowd to free a prisoner. John 19:14 "And it was the preparation of the passover, and about the sixth hour: and he saith unto the Jews, Behold your King!" Emphasis added. This also fits another criteria I knew had to be true of Jesus, that He being the sacrificial Lamb of the world, Genesis 22:8 "And Abraham said, My son, God will provide himself a lamb for a burnt offering..." - the Lamb of God had to die on 14 Nisan before sundown, Exodus 12:3 . Furthermore, John 12:1 says that Jesus was anointed on the 8th of Nisan [6 days from the Passover.] The next day as Jesus was riding a young colt, per prophecy, Zechariah 9:9 , all the people worshiped their King. Verse John 12:36 says after this time Jesus hid Himself until the hour; set aside just like the sacrificial lamb, Exodus 12:3 ! Tears begin to well up in my eyes just thinking how wonderful the Lord is and how unworthy we are even of these gems in Scripture. Scripture says that Jesus was in the grave 3 days so there had to be a specific week of Sabbaths otherwise the women would have prepared Him for burial. First the Sabbath of Passover, then the next day was the feast of harvest (Leviticus 23:10-12), then they had a few of hours to prepare for the weekly Sabbath that started at sunset. The order being Sabbath - Feast Day - Sabbath then resurrection. The only years that fit were 3787, 3790, and 3797. Since I found the birth date of Jesus, the only date to pick was 3787, which surprisingly I had already had as a possible date. I know that this may mean nothing to you, but the Lord showed me all I needed and slowly put it together. Jesus' last Passover was actually on the 13th of Nisan 3787 (8 April 27 AD), a Tuesday, just after sunset making it the 14th. Very late that night they came for Jesus and held a mock trial and had him sent to Pilate for judgment. As seen in John 19:14 that was the day of preparation. The series of events are that Jesus had His last Passover on the evening of the 13th of Nisan, (making it the 14th after sunset) this is furthered because when they took Jesus it was already the 14th of Nisan. Remember days change at sundown. John 18:28 says they took Jesus to the hall of judgment but they did not go in because they were clean and could partake of the Passover, Numbers 9:7-14 . It took 29 days to become clean once one was made unclean according to Numbers, but that little truth was twisted by the Pharisees into some ritual that bore no resemblance to the truth. So this also shows that only Jesus and His disciples had already celebrated Passover. Since Jesus was presented at 6 am, and rejected by the Jews, He was led away to be crucified. At 9 am He was put on the cross, Mark 15:25 . At noon all darkness fell on the whole land until around 3 pm when Jesus gave up the ghost. Now since the 14th of Nisan is Passover and the 15th is a Sabbath, the guards went along to break the legs of those crucified to expedite their death because the Sabbath was coming. John 19:31-37 "The Jews therefore, because it was the preparation, that the bodies should not remain upon the cross on the sabbath day, (for that sabbath day was an high day,) besought Pilate that their legs might be broken, and that they might be taken away. And again another Scripture saith, They shall look on him whom they pierced." Again it states that it is the day of preparation. It also states that it was a High Day as opposed to a normal Sabbath. This is why I believe it had to be a Sabbath then a Feast and then another Sabbath, which narrowed the years to 3790, 3797 or 3787 because the 15th of Nisan only falls on Tuesdays, Thursdays, Saturdays and Sundays in the Jewish calendar. Since the 16th is a Sabbath and there needed to be a reason for the three days in the tomb undisturbed, that left me with those dates. Those were the only ones that had 15 Nisan fall on Thursday, a Sabbath on the 16th a Feast of Firstfruits on the 17th, then the weekly Sabbath which ended Saturday night after sundown. Paradigm three smashed - Jesus couldn't have died on a Friday and remained in the tomb for three days and then have Mary and the others come "after the Sabbath" to anoint Him, which had already been done on the 8th if you remember by Mary, John 12:3 ! Wednesday 14 Nisan - Jesus is tried early in the morning before dawn, brought before the people by Pilate at 6 am - Day of Preparation for the evening's Passover. Jesus is crucified at 9 am, noon the sun is blackened until when Jesus gives up the ghost around 3 pm and is put into the tomb hastily because the sun is going to set within the next couple hours and that starts the Sabbath. The Lamb of God had been sacrificed just like all the lambs that very day for that night's Passover! Thursday 15 Nisan - Feast of Unleavened Bread - bread without yeast [life] - because the Bread of Life had died!!! - High Sabbath, also the day the Pharisees asked to have the tomb sealed because they knew of the promise of His resurrection, but thought His disciples would steal the body, Matthew 27:62 . Friday 16 Nisan - Feast of Harvest - Numbers 28:26 , Leviticus 23:10-12 - then a few hours to prepare for the Sabbath that starts at sunset. Saturday 17 Nisan - Typical Weekly Sabbath - from Friday sundown to Saturday sundown using Western dating system. This is by far the hardest to understand because the Feasts and Sabbaths start after sundown, and are completed the next sundown, but during the night, the date changes [i.e. the number]. Ok, so you're still not convinced, that's fine. Remember I mentioned that I went through the whole Bible to find any reference to a date? Well that study, completed after this one, gave me another confirmation of Jesus' date of His death. It comes from Daniel 9:25-26 , "Know therefore and understand, that from the going forth of the commandment to restore and to build Jerusalem unto the Messiah the Prince shall be seven weeks, and threescore and two weeks: the street shall be built again, and the wall, even in troublous times. And after threescore and two weeks shall Messiah be cut off, but not for himself: and the people of the prince that shall come shall destroy the city and the sanctuary; and the end thereof shall be with a flood, and unto the end of the war desolations are determined." Ezra is the source to finding this date. In Daniel's 70 weeks of 7 years (490 years), the Messiah would die 69 weeks of 7 years or 483 years later, that is clearly in scripture, as you can see. The understanding of when this series of years starts is "... going forth of the commandment to restore and to build Jerusalem..." When did this occur? Well let's start with when the first Jews from Babylon returned to Israel to "rebuild the temple". Cyrus gave a decree for the Jews to return to Jerusalem to rebuild their temple. Josephus says that Cyrus read the book of Isaiah and saw that he was mentioned as the chosen one to rebuild God's house, Isaiah 44:28 . Cyrus was so moved that he made the decree in 538 B.C. [year 3223 in Jewish calendar], which was his first year of reign as King of Babylon, Ezra 1:1 . He was already King of Persia from 559 B.C. Ezra and Nehemiah counted the people, which came to 42,360 Jews, 7337 servants, and 245 singers, for a total of 49,942 souls left Babylon, Ezra 2:64 , Nehemiah 7:66-67 . Very few considering the number that went into captivity. So with the decree they went back to Jerusalem to start building the House of God, Ezra 1:3 - not the city, so this decree isn't the one from Daniel. The Jews were hindered by the adversaries of Benjamin and Judah all the way until the second year of the reign of Darius I, 519 B.C. At this time all work ceased, Ezra 4:24 . By the leadership of Haggai and Zechariah, the work resumed and the rulers of the area wrote letters to King Darius to make them stop and to verify their claim to build the House of God by Cyrus' decree. Well it was found to be true and Darius made a decree not to hinder the work, Ezra 6:1-12 - Ezra 6:1-12 . Again for the House of God alone, so this too isn't the decree of Daniel prophecy. Finally, the temple was completed in the sixth year of Darius (515 B.C. ) on the third day of the twelfth month, and in the following month they kept the Passover. Ezra 6:15 , Ezra 6:19 . King Artaxerxes, in the seventh year of his reign (457 B.C. ), authorized Ezra the priest and scribe, and all who wished to join him, to go to Jerusalem. It was Ezra's desire to instruct the Jews in the laws of God. Artaxerxes granted him large amounts of silver and gold to furnish the temple, and gave instruction that his treasurers on that side of the river should provide whatever was needed to beautify the Lord's house. In the decree, Artaxerxes commanded Ezra to "set magistrates and judges, which may judge all the people that are beyond the river, all such as know the laws of thy God; and teach ye them that know them not. And whosoever will not do the law of thy God, and the law of the king, let judgment be executed speedily upon him, whether it be unto death, or to banishment, or to confiscation of goods, or to imprisonment." Ezra 7:25-26 . Ezra left on 1 Nisan 3304 (26 March 457 B.C.) to go to Jerusalem. This is the decree of Daniel's prophecy. Why? Because the next decree for Nehemiah is too to rebuild Jerusalem, but Ezra was told to set up the city and the government. The letter of Ezra's decree was not preserved, but we can see by the rulers of the area complained again and the work was stopped, Ezra 4:17-22 . Nehemiah's story begins in the 20th year of Artaxerxes' reign. Nehemiah was praying that the Lord would give Nehemiah favor in the King's eyes so that Jerusalem would be restored. God granted his desire and Artaxerxes gave Nehemiah leave to go and build Jerusalem. Although the text wording would make this decree the decree of Daniel, this one really was just a reaffirmation of the one given to Ezra, which we do not have the wording to, but we know it was to not only beautify the Temple, but to build the city. This was clearly understood to be an authorization for the full reestablishment of Jerusalem and the Jewish nation; for shortly after this the enemies of the Jews wrote to the king complaining that "the Jews which came up from thee to us are come unto Jerusalem, building the rebellious and the bad city, and have set up the walls thereof, and joined the foundations" Ezra 4:12 . That the walls had been completely set up was obviously an exaggeration, as verse 13 reveals. Yet this incident shows that for the first time there was actual work being done to rebuild the city. This had not been the case under the previous decrees. King's years. Something that must be understood in understanding a statement like "in the seventh year of his reign" is that to the Jews, the first year of a king's rule isn't the completion of 12 months, but in the completion of the first calendar year. That is, if a king took office in April, the completion of his first year wouldn't be until 20 months later. This is why, if you decide, and you should, if you verify my dates with encyclopedias and history books, you'll find that some say that Artaxerxes' reign started in 465 B.C. and others will say 464 B.C. - it depends on how the "year" was counted. So to us, the first year of Artaxerxes' reign is both 465 B.C. AND 464 B.C. as his accession year. That means that some books are counting from the calendar year (from April to April in our example, 12 months) and others count as the Jews and Babylonian's did (from April to the 2nd December - 20 months). From our decree time of 1 Nisan 3304 + 483 years = 3787, exactly 483 years, 13 days later, Jesus died on the cross for His people. Daniel 9:26 , "And after threescore and two weeks shall Messiah be cut off..."
When you look at all the precedence and the facts, it is so awesome to make such a discovery like this. I am so very grateful to the Lord for this. All glory and honor are His!!!! For amazing comparison, here is a list of events in biblical history for Nisan and Tishrei. Mark 16:1-2 "And when the sabbath was past, Mary Magdalene, and Mary the mother of James, and Salome, had bought sweet spices, that they might come and anoint him. And very early in the morning the first day of the week, they came unto the sepulchre at the rising of the sun." Remember the feasts and how they worked. In order for the ladies not to go and prepare the body of Jesus for 3 days there needed to be 3 special days. The Jewish year 3787 (27 AD) fit perfectly. The 15th of Nisan, Thursday that year (15th NEVER falls on a Friday) is the Feast of Unleavened Bread, a high Sabbath. Then the 16th of Nisan is also the Feast of Harvest, because it is the morning after the sabbath of Unleavened Bread. So then at sundown started the normal Saturday sabbath begins. Mary Magdalene could only have bought the spices, after the quick burial of Jesus, during the afternoon of Friday, or after sundown Saturday night. Then the next morning they went to the tomb before sunrise (c. 5am is sunrise that day.) Jesus rose from the dead anytime after 6pm (a. sunset) Saturday. Rebuttal about a Friday death. We know that Jesus died on the 14th of Nisan. If the 14th were a Friday (which is possible), and if Jesus had died before sundown Friday, the women could not have bought spices until the following Monday because of the double Saturday Sabbath on the 15th (Saturday) and the Feast of Harvest on the 16th (Sunday) of Nisan. That alone rules it out, no matter what anyone says. Get any calendar and you'll see that the 14th of Nisan only falls on a Monday, Wednesday, Friday, or Saturday only! A combination of Sabbath-Feast-Sabbath was needed for Jesus to be undisturbed for 3 days and 3 nights. That year was 27 AD which 14 Nisan fell on Wednesday!!! Glory to God He provides the gems!!! Luke 3:1 "Now in the fifteenth year of the reign of Tiberius Caesar, Pontius Pilate being governor of Judaea, and Herod being tetrarch of Galilee, and his brother Philip tetrarch of Ituraea and of the region of Trachonitis, and Lysanias the tetrarch of Abilene,"
This is the only place that this is mentioned in scripture. There is also a lot of debate on this point, but I've found out that after Tiberius won his military victory in Illyricum (Germany) in 9 AD he was made ruler over the military and in 10 AD was made co-regent with Cesar Augustus so that when he died Tiberius wouldn't be rejected as ruler - not being the blood of Augustus. Luke wasn't a Jew, but a Roman Gentile and would have known this. Tiberius ruled from 14-37 AD yet it is this year, year 25 AD that Luke says is his 15th year of reign, his co-reign. This is accurate as Tiberius took the co-regency in the year 10 AD + 15 = 25 AD. This fits perfectly with the almost 3 year ministry of Christ and Him dying in the year 27 AD! Furthermore, Pontius Pilate was the sixth Roman procurator of Judea, and under him our Lord worked, suffered and died, as we learn not only from Scripture, but from Tacitus (Ann. xv. 44). Pilate was appointed in the twelfth year of Tiberius, 22 AD, not 26 AD as reported in modern books. This is shown as fact by the mention of him being the ruler of Judea in Luke 3 when Jesus was baptized by John in 25 AD. John 2:19-21 "Jesus answered and said unto them, Destroy this temple, and in three days I will raise it up. But he spake of the temple of his body." Josephus reports (Josephus, Antiq. 15:38-425; Wars,5:184-247) that the temple was started being built in 25 BC (3736) and the majority of it was completed within the first three years, making its opening 22 BC (3739). 3739 + 46 years = 3785 (25 AD). Perfect again! God is so wonderfully accurate in His word. 194 Olympiad, 4th year is year 1 BC to 1 AD according to Wikipedia. Year "0" doesn't exist, 1BC - 1AD is 1 year so you subtract 1. 26 AD - 1 = 25 AD. John 2:19-21 "Jesus answered and said unto them, Destroy this temple, and in three days I will raise it up. Then said the Jews, Forty and six years was this temple in building, and wilt thou rear it up in three days? But he spake of the temple of his body." Since Jesus was crucified on Wednesday (14 Nisan - day of preparation; Luke 23:54 & John 19:42 ) about 3 pm (Matthew 27:46 - Roman time which started at 6 am) (2 1/2 to 3 hours before sunset - remember they were trying to bury them so they all could partake in the Passover and the beginning of the "High" Sabbath - 15 Nisan) and now it was Sunday (Matthew 24:1 & Luke 24:13 ) just before sunset (Matthew 2:11). Not counting the 3 hours of Wednesday, at 6 pm it changed to Thursday and you have the start of day 1, at 6pm Friday, the start of day 2 and 6 pm Saturday the start of day 3. Since their conversation was before sunset Sunday, it was still "third day since these things were done." Now you say, "what about the sign of 3 days and 3 nights (Matthew 12:40 )?" Thursday night, Thursday day, Friday night, Friday day, Saturday night and Saturday day. The hard part to remember is that the "day" changes at night, sunset. This also helps us to understand how the women could go and buy spices "after the Sabbath" (Mark 16:1 ) and yet go before sunrise Sunday to the grave to anoint Him (Mark 16:2). The time from 6pm to - who knows - some shops may have opened to let those folks who needed stuff buy before going to bed. The times for sunrise and sunset for April 10th is 5:17 am and 6:04 pm. So that Jesus died Wednesday only to have the day change in 3 hours to me seems of no importance in the "day/night" count.